Any girl knows that the Matric dance is one of the truly special occasions in life where you get to be part of a very magical and memorable event. At Rosenwerth we understand the excitement of creating the perfect dress that lets you unleash your wildest and most creative dreams in a very fun and unforgettable way. Seeing as more and more schools are deciding on starting the farewell celebrations earlier in the year, a lot of girls are wondering what implications those colder months will have on the design of their matric dance dress. For Gabi Rosenwerth this only means that the design process of each individual dress becomes that much more creative. Floor length dress styles coupled with sheer, high-neck bodice designs are currently trending and are perfect for additional layering. Even though the South African winter season can be quite nippy around the heels it should by no means inhibit your unique vision or style. You can still define your own preferences when fitting on dresses or coming up with your own dress design ideas. There are a myriad of unique styles, designs and materials to choose from when it comes to creating your dream dress. Many of these delightful variations provide additional coverage to guard against frosty forecasts without compromising on those intricate design characteristics that you love. At Rosenwerth we pride ourselves in turning your long-awaited fairy tale into a reality while also considering the practicality of the different dress designs until you are completely satisfied. Floor length dress styles coupled with sheer, high-neck bodice designs are currently trending and are perfect for additional layering. The top colours for this fashion season include red, rich hues of burgundy, black, green and mauve that perfectly capture the elegance of colder months. Noteworthy bright and bold colours include different shades of yellow and pink that lends a charming flirtatious and fun vibe to any matric dance dress. 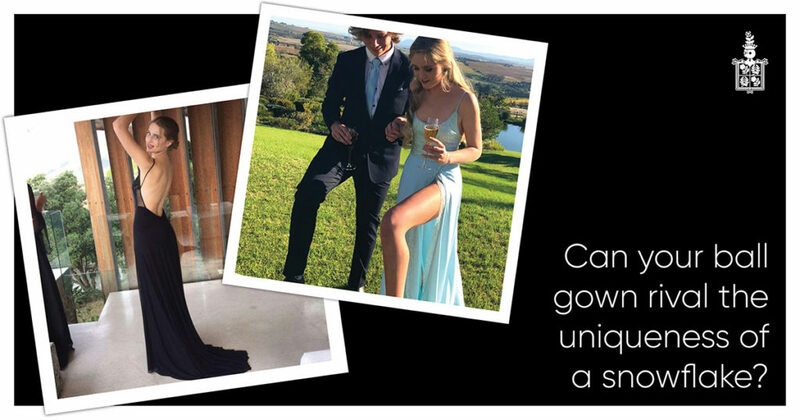 Contact Gabi and embark on the magical journey of designing your very own matric dance dress today. This entry was posted in Dance dresses and tagged #dancedresses #matricfarewell #winterseason.